Dialysis is the most common treatment for kidney failure. A dialysis machine is an artificial kidney that is designed to remove impurities from your blood. During dialysis, the dialysis nurses use the dialysis access to access your bloodstream, so your blood can be circulated through the dialysis machine. The purified blood is then returned to you, again through the dialysis access. What is a dialysis access? A dialysis access is an entranceway into your bloodstream that lies beneath your skin and is easy to use. The access is usually in your arm, but sometimes in the leg or neck, and allows blood to be removed and returned quickly, efficiently, and safely during dialysis. Why is a dialysis access necessary? It is necessary for you to undergo dialysis if your kidneys are incapable of cleaning the waste products out of your bloodstream. A dialysis access point is necessary for you to be able to undergo hemodialysis. Without an access to your bloodstream, it is not possible to perform the procedure. Are there different types of dialysis accesses? Yes. The three main types of dialysis accesses are fistulae, grafts, and catheters. What kind of dialysis access is right for me? The most popular kind of portal is called a fistula, in which an artery and vein are joined under the skin in a minor surgical procedure. Because it is less likely to form clots or become infected, a fistula is considered the best choice of access to the bloodstream. If properly maintained, a fistula may last years or even decades. Some people are unable to undergo fistula placement because their veins are too small. In these people, arteriovenous grafts are usually placed. An AV Graft (also known as an AVG) is a man-made tube, consisting of a plastic or other material (such as a cow's artery or a piece of synthetic material), that your vascular surgeon inserts under the skin to connect an artery to a vein. This procedure is usually performed with a combination of local anesthetic and sedation. While grafts can last for years, they tend to be more problematic then fistulas, and are more prone to developing clots or becoming infected. Individuals who suffer from sudden kidney failure or problems with their fistula or graft will undergo dialysis for a period of time using a catheter. A catheter is a soft, thin, flexible tube that is inserted into a large vein in the neck, the chest, or the leg near the groin. Catheters rarely are a permanent solution. They can clog, become infected, or dislodge. As a result, the physician will recommend the creation of a permanent portal under the skin. How does a dialysis access work? For both fistulas and grafts, the connection between your artery and vein increases blood flow through the vein. In response, your vein stretches and becomes strengthened. This allows an even greater amount of blood to pass through the vein and allows your dialysis to proceed efficiently. In the weeks after surgery, the fistula begins to mature. The vein increases in size and may look like a cord under your skin. Once it has matured, a fistula should be large and strong enough for dialysis technicians and nurses to insert the large dialysis needles easily. If it fails to mature in a reasonable period of time, however, you may need another fistula. What kind of doctor performs dialysis access surgery? A vascular surgeon performs dialysis access surgery. 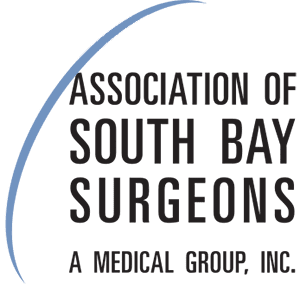 There are four vascular surgeons here at the Association of South Bay Surgeons: Dr. Adoumie, Dr. Kaviani and Dr. Litwinski. What kind of complications can I expect to have from dialysis access surgery? Ideally, we would hope that all of our patients are able to use their dialysis access without complication. However, there are two main problems that can happen with this particular type of surgery. They are clotting and infection. In the event of clotting, the fistula or graft is surgically fixed in a procedure called a thrombectomy, a procedure where the graft or fistula is opened and the clots are removed with a special kind of catheter. Infections can sometimes be treated via antibiotics. In severe cases, the access may have to be surgically removed to treat the infection. A new access would then be placed in another area of the body.